Juneberry at UVMC is growing! 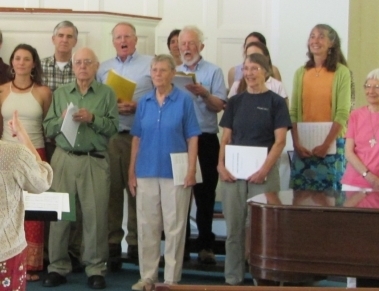 We started as Juneberry Music Choral Singing School in the fall of 2012 with 42 students, and by the fall of 2018 session, 112 people were involved in either the chorus, classes, or circlesinging. Students come from all over the Upper Valley, including Bradford, Corinth, Vershire, Brownsville, Strafford, Lebanon, Woodstock, Hanover, Norwich, Lyme, Piermont and Thetford. Many are returning students who have been with the singing school since we started in 2012. We also welcome plenty of newcomers, who learn about the school through friends, list serves, or newspaper articles. 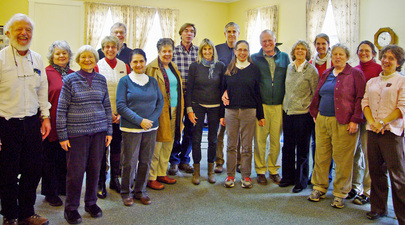 Our groups are a mix of men and women, students to retirees, seasoned singers and newbies. Some come to us pitch-perfect and able to read music, while others develop these abilities along the way. Whatever the skill level, all of the students bring a love of singing, an eagerness to learn, and a sense of playfulness that leads to laughter, focus, and deeply satisfying music making. Monday morning Choral Singng School, Fall 2013..